I brought two big cardboard boxes down from the attic the other day. My life is in those boxes. They are full of photographs--full of other versions of me, other time periods, memories, people, places. I have been pulling them out by the handful and sorting through them. I have been exclaiming in wonder; caught off-guard by things, people, and moments I had forgotten. We are so many different people over the years. I have photos of me as a young teen with braces, big glasses, and feathered bangs-- the '80s were not kind. There are handfuls of school photos from that time signed on the back with love from friends I barely remember and friends I have lost touch with. I am in my twenties and newly married. I am a new mom. My kids arrive and I am not in the photos much anymore because I am behind the camera. There are five million of my son with his happy grin and chubby belly. There are almost as many of my daughter, adorable and shy. When my daughter was a few months old we got a digital camera and the photos are all on the computer now. We can scroll through them whenever we want but somehow it isn't quite the same. 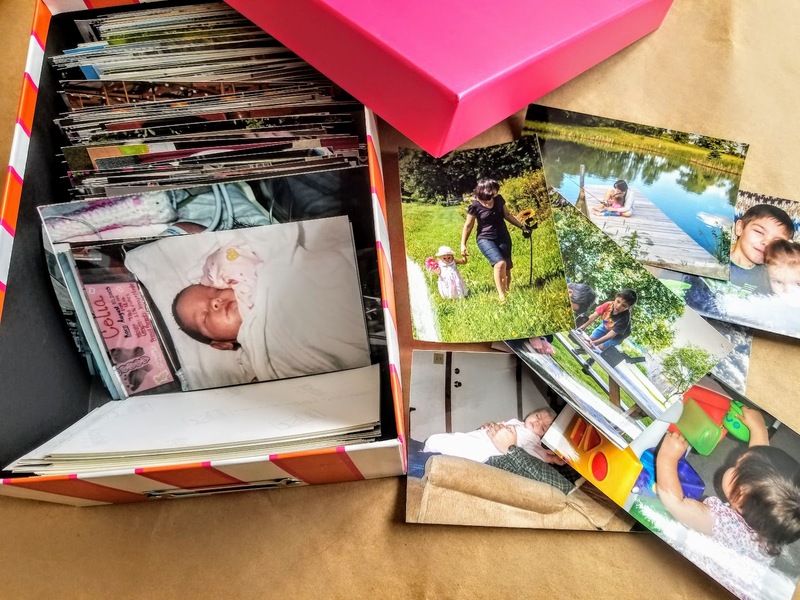 I do it sometimes and ooh and aah over the memories but shuffling through stacks of photos or paging through photo albums feels different. The photos are tangible and somehow that makes the memories tangible too. I am there at 16 in the middle of a slumber party with my friends. My kids are little again. My husband and I are young and newly in love. That trip just happened. I feel like I can walk down that street, walk into that room, talk to that person. I showed lots of the photos to my kids. They were polite about some, baffled by the fashion choices in many, and quietly fascinated by their resemblance to us. Yes, my son does look just like his father and a lot like my brother. How is that possible? I sorted all the photos and threw away the blurred ones and the duplicates, or most of them. It is hard to throw away cute photos of your kids no matter how many similar photos you have. I put them in photo boxes in vaguely chronological order and then I stacked the boxes on a shelf. I might not look at them again for a long time but they are there, waiting for me. All our past lives. Our memories. When I was younger, I had a film camera, and I loved getting the pictures developed and seeing how they came out. With digital, there's much more instant gratification, but you don't get the tangible memory. I'm a big proponent of printing out my digital pictures. For a while, I was making photo books and that was nice but I have gotten out of the habit. I really should start doing it again. I love actual photos, it's one of my favorite things about working in archives. I have a box of my own that I've been meaning to sort out for years now. These boxes have been moved from house to house and left in attics for longer than I want to think about. At least it is finally done. I have always thought your job sounded interesting. Like you our actual photos have come to a standstill, everything is on the computer but I really feel that I must get around to getting a lot of them printed out - for posterity. We don't even have any photos from our youngest son's wedding over two years ago now. I'm ashamed to say they're all on a CD. Yes, I think I might go through some of the old digital photos and print them out. Then my future grandchildren can flip through them one day. love looking at old photos,memories, trips, friends, family..I've developed some photos of my baby boy but haven't organized the album yet! It is hard to find the time when you have a baby! It is nice to have the memories though.